Is that actually in downtown Dallas? I don't see any buildings in the background. Flex-N-Gate, a major supplier to General Motors' Arlington vehicle assembly plant, last summer purchased a new 430,186-square-foot industrial building at 2150 Bardin Road in Grand Prairie. The 165-room luxury hotel is part of the Epic mixed-use development being built at Elm Street and Good-Latimer Expressway. The hotel project — which just received $2 million in city tax incentives — is set to open in mid-2020. "We've been searching for the right opportunity in Dallas," Mike DeFrino, chief executive at Kimpton Hotels & Restaurants, said in a statement. "Deep Ellum's vibrant culture, renowned art galleries and incredible concert venues are a perfect match for our unique take on boutique hospitality." The San Francisco-based hotel operator now operates more than 60 hotels and 80 restaurants and bars in the United States, Europe, Caribbean and China. Builder Mill Creek Residential Trust is constructing a 5-story, 344-unit rental project on Noel Road north of LBJ Freeway. "We had the first development community in the new Midtown district, which was incredibly well-received by residents, exceeding our expectations," Mill Creek's senior managing director Rick Perdue said in a statement. "We hope to continue that success next door at Modera Dallas Midtown. Now a Stonelake Capital company has filed preliminary plans with the city of Dallas for a third apartment complex to be constructed in the project. "Our initial planning for Trinity Green 3 is a 5-story building totaling 278-units and will be along Singleton Boulevard," Stonelake managing partner Kenneth E. Aboussie Jr. said in an email. "Trinity Green will have five multi-family phases in total." Trinity Green will be an urban residential district with 1,500 units in total." Apartment builders have broken ground on the second phase of rental units in a mixed-use project near Dallas' Love Field. Irving-based developer JPI is building an additional 354 apartments in the $200 million West Love development on Mockingbird Lane. "There is no doubt that the West Love development is going to be a top attraction in Dallas, and we're extremely grateful to be a part of this exciting venture," Matt Brendel, senior vice president and development partner at JPI, said in a statement. Parking lot lights have been removed, and equipment is on site. Atelier has a slender tower angled to take advantage of downtown views while minimizing solar reflection on the Nasher Sculpture Garden, Burnett said. The materials chosen for Atelier are compatible with the contemporary stone and steel materials found in the district, he added. They should tear it down. It's really ugly. "Our goal is to make 2401 Cedar Springs a part of Uptown, engaging not just the people who work there but those who live, work and play nearby." For Uber to get its “flying taxis” in the air, the ride-sharing company will need launch-and-land pads — called skyports — to support the futuristic service. At Uber’s second annual Elevate summit in May, six architecture firms presented their designs for what the skyports will look like. Today, we'll look at the concept from Dallas-based Humphreys & Partners Architects, which is modeled after a beehive because the Uber aircraft around the skyport would replicate a bee’s flight patterns to and from a hive. Prototypes of the Uber aircraft are under development by Fort Worth-based Bell and a handful of other manufacturers nationwide. Dallas developer Hillwood Properties also is working with Uber on the flying taxi program. UberAIR plans to start demonstrating the technology in 2020 in Dallas-Fort Worth, Los Angeles and Dubai, and start operating the flying taxi service in the three test markets in 2023. From there, San Francisco-based Uber plans to roll out the service in large urban areas worldwide. Humphreys & Partners is one of six design finalists for the project. Other DFW finalists include Dallas-based Corgan, BOKA Powell and Beck, and Duncanville-based Arup. Equinix - a global data center company which paid $800 million for the Infomart - says it plans to build a $21.25 million, 61,805 square-foot building on at the Infomart at 1900 N. Stemmons Freeway. The 1.6 million-square-foot Infomart building was built in the 1980s and is located northwest of downtown Dallas. Info mart's owners didn't provide details of what would be built or when. The April Infomart sale was one of the priciest property purchases in Dallas history. The filigreed, 7-story building on Stemmons Freeway was patterned after London's famed 19th century Crystal Palace. With 36,264 home starts in the 12 months ending with the second quarter, D-FW far surpassed other big American housing markets for total production, according to a new report by housing analyst Metrostudy Inc.
D-FW builders are starting about 40 percent more homes than in the Atlanta and Phoenix metro areas and almost 70 percent more than in Denver. D-FW home starts rose 12.7 percent annually in the just-released second-quarter housing comparison. North Texas has been a leading U.S. housing market since the end of the Great Recession. "We will continue to secure the top position for the next few years," said Metrostudy's regional director Paige Shipp. "During the past 12 months, we started 6,300 more new homes than Houston [the No. 2 U.S. market], and our growth pace is twice that of Houston. Dallas' hotel building boom shows no sign of a let up. 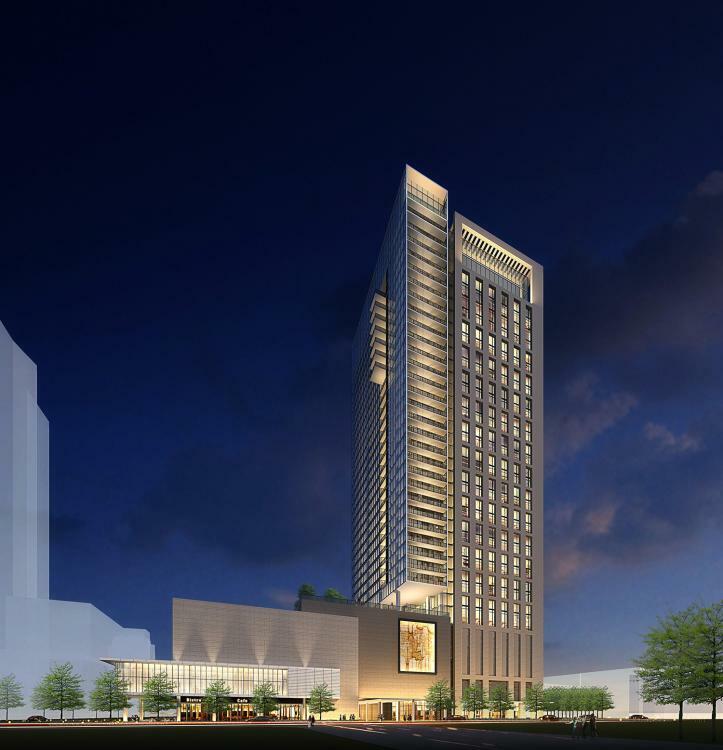 Dallas has a total of 156 hotel projects with 18,908 rooms in the construction pipeline or planned in the second quarter, according to a new report by Lodging Econometrics, which tracks hotel construction. New York City was first in the country with 169 hotel projects. "If all of the projects in the pipeline eventually come to fruition, this will increase the city's guest room supply by 21.3 percent," Lodging Economics said in the new report. "Dallas should continue its fast-paced growth. "In the first half of the year, it led all markets for the most new hotel projects announced into the pipeline, with 27 projects and 3,195 rooms." Most of the current construction in the Dallas area is located in Denton, Lewisville, McKinney, Plano and Frisco, according to the report. "Historically, according to our hotel real estate intelligence, the New York City market has led the construction pipeline by projects since third quarter 2011," said J.P. Ford, Lodging Econometrics' senior vice president. "This has been followed by Houston. "However, in Q1 2018, Dallas surpassed Houston to take the second spot in regards to hotel construction," Ford said. I enjoy your postings Mr. Bear. Being the father of twins I find the competition between Houston and Dallas familiar. There is no "primate city" in Texas as in New York, Georgia, or Illinois which leads to rivalry. The two metro areas are very dynamic, bursting and at the seams, and many similarities. A great deal of beautiful architecture is going up in both. Architecture is what attracted me to Haif in the first place. I go to other websites to see architecture of other great cities. The high-profile building on the edge of Dallas' Uptown district was acquired by Dallas' Highland Capital Management in one of the largest building sales in Dallas so far in 2018. The 42-story Cityplace Tower on North Central Expressway is the tallest building outside of downtown Dallas. Built in 1987, the 1.4 million-square-foot high-rise has been owned since 2013 by Florida-based investor Parmenter Realty Partners and Angelo, Gordon & Co.
"We hope to transform the surrounding area with our strategic renovations and improvements," adds Dondero. "Cityplace was designed to anchor an ambitious urban development, and we believe our plans will revitalize that vision." A plan in the works would convert a historic building in downtown Dallas' West End district into a new hotel. The Sanger Brothers garage at 711 Elm St. was built in 1925 as one of the city's first "high-rise" parking garages. The five-story brick building sits across the street from where the Sanger Brothers department store was — now El Centro College. Irving-based hotel firm Icon Lodging bought the Elm Street building in April and has been working with Dallas' Merriman Anderson Architects to come up with a plan to redevelop the garage. Merriman Anderson recently made a preliminary presentation to the Dallas Landmark Commission, which asked them to go back to the drawing board and rework the hotel proposal. The initial plan would have added six levels of hotel rooms on top of the old parking structure. But commission members and staff weren't fully on board with that plan. "Our client wants to find a way to make this happen," Anderson said. "It's a unique and special building. "We are working hard with the Landmark Commission, and they have been responsive and understanding." Developers have broken ground in Far North Dallas near the Galleria on a new apartment and retail center. The project by PegasusAblon includes 289 luxury rental units plus the redo of an existing shopping center with an amphitheater and stage, fountains, dining and additional retail. Called Ablon at Galleria Muse, the mixed-use project will be at the northwest corner of Alpha and Noel roads across the street from the Galleria shopping mall. Dallas' PegasusAblon and partner Lionstone Investments plan to have the project done by early 2020, said developer Michael Ablon. "We wanted to create an urban project that is a complimentary experience to the Galleria mall," Ablon said. "This is going to be the heart of that whole area." "We are building on what used to be the parking lot," Ablon said. The six-story apartment block will include a parking garage and additional ground floor retail space. "Our plan is to re-engage visitors at the street level, creating a destination environment for the community," Ablon said. The historic southern Dallas University is constructing the 40,000 square-foot educational and residential building with the help of $7 million in contributions. The multipurpose building will be named after one of the university's biggest benefactors, Dallas businessman and environmentalist Trammell S. Crow. RBA Architects designed the new building and Crimson Building Co. and Burchfield & Partners are developers of the project. "The Crow Living and Learning Center will be the first of many new structures built on this campus," Paul Quinn College president Michael Sorrell said in a statement. The school is the oldest historically African American college west of the Mississippi River. Baylor Scott & White Health plans to build a large office administration complex with more than 600,000 square feet of construction in the 3700 block of Elm Street. The planned office center is just south of Baylor's huge Dallas campus. Building permits value the project at more than $70 million. Cityplace has asked the city for approval to build a project that is larger than the current zoning allows. "It's one of the last two sites we have left," said Cityplace president Neal Sleeper. "We are trying to pump up the density a little bit. We've got all the height we need." Sleeper said the planned high-rise for the site would be mostly office space. "We are hoping to do a significant office building and a hotel," he said. "That's where the second tower was originally going to be, so we want to have something of prominence." Sounds alot better than a Sams Club. Sometimes localized neighborhood opposition to a questionable development makes for a better quality development in the end. Plus, the site is too prime for a Sams Club IMO. Developers and city officials say the commuter consternation will be worth it early next year when a $10 million-plus makeover of the retail crossroads is done. Dallas was well past its prime when neighborhood leaders and city planners began crafting a redo. Now construction is underway on upgrades for the shopping village that's at the heart of one Dallas' 1950s neighborhoods. "We are 30 days into what we believe will be a 6- to 8-month renovation of the buildings at the northwest corner," said Daniel Fuller with Dallas' Shop Cos., which is redeveloping the landmark retail center. Originally called Casa View Hills, the retail strips served growing post-World War II neighborhoods where you could buy a new house for less than $8,000. Built with antique brick and decorative wrought iron, the Casa View buildings that Shop Cos. is now rebuilding were described as "New Orleans-style." The new owners plan to restore the buildings and bring in new retail and restaurant tenants. "There are probably three or four tenants that have been there since 1954," Fuller said. "There is an art and science to merchandising a property that has the history Casa View has. "We want to keep some of the tenants that have been there for a long time." Award-winning Dallas architect Omniplan — the same firm that designed Liberty Mutual Insurance's huge new Plano regional offices and NorthPark Center shopping mall in Dallas — worked with Casa View's owners, residents and the city on a renovation plan. "The neighborhood, you could tell, was once something really fantastic," said Omniplan's Amanda Buckley. "This project is about getting back to what it was. "There is a lot of opportunity there," she said. "It's not like a standard suburban shopping center with no character." "It's a wonderful eccentric property, and our goal is to do a sensitive restoration," Fuller said. "We want to preserve the original brick with the wonderful patina." The storefront canopies will be restored, lights and signage upgraded and the central plaza reworked with new paving and landscaping. "We are planting 60 new ornamental and shade trees at Casa View," Fuller said. "I think by year-end it will be quite a lot different." Neighbors like what they are hearing and wish it could move even faster. The primary difference is that it does not include the much-hated Sam's Club. Other than that, the differences between the original and this new development proposals are pretty minimal. The primary difference is that it does not include the much-hated Sam's Club. Other than that, the differences between the original and and new development proposals are pretty minimal. I disagree. Smaller shops, square footage-wise makes much better sense here in the inner city than one massive, big box retailer. The few smaller shops and structured parking substituted for some big box space is the minimal difference. It's still a big box with acres of surface parking and some freeway-frontage pad sites. The 70-unit Fitzhugh Flats development will have 1-bedroom and studio apartments averaging just 615 square feet. The project is being built east of downtown Dallas between Ross Avenue and Live Oak Street. The project will include garages and covered parking spaces, storage units, a lounge and dog park for residents. "Our goal is to provide a project that will appeal to the majority of renters in the market based on the price point" said Reid Beucler, principal of Slate Properties LLC. "With projected rents starting around $1,200 per month, we feel like we are positioned well to compete with the other communities in the neighborhood." Not a fan of the surface parking, but this is what Dallas needs more of - developments that fit the context of their neighborhood. Gloria’s restaurant moved to Fire Station No. 15 on Bishop at Davis in 2011, and the local chain’s original building, at the southeast corner of Davis and Llewellyn, was demolished in 2013. The lot sat vacant for years until recently. A new restaurant building is under construction on the site now. A listing from the Woodmont Co. says the building will comprise 2,546 square feet and have a 900-square-foot patio. The supermarket will be part of a high-rise development planned for the block at McKinney and Lemmon avenues that will include offices, shops and restaurants. "We see this project as the unifier between Uptown and what's going on in Cityplace and the West Village," said KDC president Toby Grove. Instead of just remodeling the existing building, Central Market will occupy the lower levels of a 19-story mixed-use project KDC plans for the high-profile Uptown block. Dallas architect Omniplan and San Antonio design firm Lake|Flato are designing the development, which will take up most of the 4.8-acre block between McKinney and Oak Grove. "It's going to be very well-connected with the DART rail station nearby and the street car that stops out front." KDC plans to build a 2-acre public plaza on the roof of the Central Market that will have access to the office tower and shops and restaurants facing the elevated public space. "Central Market shoppers will have parking on two levels of garage on top of the store," said KDC executive vice president Walt Mountford. "On top of that, the amenity deck will have great views of downtown. "It's going to be a great experience for both the retail users and tenants in the office building." "This will be largest store in Central Market's portfolio," Mountford said. "There will be a total of 150,000 square feet of retail in the entire project. The planned Uptown store will be Central Market's seventh location in the Dallas-Fort Worth area. KDC will seek zoning changes for the Uptown block to allow the construction of the development, including asking for an additional 85 feet in building height. The 450,000-square-foot office tower is being made taller to allow for the plaza area on the south side. The Office of James Burnett — the same firm that did downtown's Klyde Warren Park — is designing the plaza and street-side landscaping. "This will be the longest storefront on McKinney Avenue," said KDC senior vice president Colin Fitzgibbons. "The pedestrian experience should be great and a vast improvement over what is there today." Because of the complexity of the project and underground parking that will be excavated on most of the block, construction will take more than two years. The planned Uptown Central Market will be the fourth new urban grocery store in central Dallas that is combined with a high-rise building. Oh my god I'm moving. Go CM!! Central Market interests me. Perhaps we could create a separate thread for the upcoming "Central Market Tower"? Either way is fine. A dedicated thread would be cool though! New parking garage at Jackson and Ervay in downtown Dallas. In case you're wondering, the other three corners of the intersection, in clockwise order, are occupied by (i) surface parking with a parking garage next door; (ii) surface parking with another parking garage next door, and (iii) yet another parking garage. Howdy folks it's been awhile. Hope all is well. I lost my password but found on my old computer. It's good to come back with a bang and here it is. God I love Hines. Hopefully this will be a go for Uptown. Now FAA approved. It will definitely stand out. Would technically replace Cityplace Tower as the tallest outside of downtown.